5.6.13 ......Unique I believe to Western Australia, we have a 3000 km hike from Perth to reach the start point for our journey. We are leaving from Albany on the South Coast of Western Australia, and our first major destination to start our journey, is Broome in North Western Australia. We have spent a fortune (or so it seems) on preparing my 1999 Toyota Landcruiser which ticked over the 400k on our Kimberley Trip in 2011. And then we discovered a damp smell in the caravan, and so I took it in to have it re-sealed against moisture intrusion, and was infoirmed that I was too late, and the entire front and some of the back had already suffered ..... BADLY. And so we pick the caravan up on Monday, and then hopefully we can get moving. DAY 1. 13.6.13 Finally, we are on the road. Got away from Perth around 11am, and called into Yanchep, Two Rocks, Seabird, Ledge Point and Lancelin. The rangers are fairly strict up the Indian Ocean Road I believe regarding free camping, and so we did the right thing and checked both caravan parks, who couldn't accommodate our van size. And so, we found a spot that I have camped in a couple of years ago about 15 kms north of Lancelin, and we will see how we go. DAY 2: 14.6.13 Another beautiful day in the West, and a leisurely day drifting up the Indian Ocean Drive, calling into Wedge Island, Grey, Cervantes and a number of other little points where side tracks met the ocean. Took a left turn at the Lake Indoon/Eneabba turnoff and headed down to a delightful little fishing spot, only to find that what was a fairly easy turn around with a 30' long van 15 months ago, was no longer that easy. After a few attempts from various angles, we wound up reversing back up the road about 150m or so, and turned using a side track. Our first TEST for the trip. Portable walkie talkies are a great tool to have in the car with you. Saves so much potential aggro. Finally arrived at my "secret" freecamp point on Seven Mile Road just near Dongara, only to find two other vans already set up. Guess it's not so secret after all……….. Tomorrow is a rest day …… after only two days? We've had a fairly busy start to the week, driving from Albany to Perth, attending to getting some jobs done in Perth whilst waiting for the word to pick up the van, then on Tuesday spending the day sorting the van, Wednesday was more shopping and family, and Thursday we hit the road. Annette plans to do some fishing (we are literally 10m from the ocean) …… and anyway, the V8s are on in Darwin. DAY 3: 15.6.13 Rest day…… see Day 2 post. Annette took to the beach with her rod and fishing bucket, and came back with what was supposed to be our meal for the night ….. but turned out to be a 6 cm Blowfish. Undeterred, after lunch, she headed out again, but again unsuccessful. She could see the fish out there, but being forced to used a lure ('cos we had no bait - I should have told her where we were camping instead of making it a surprise) the fish weren't taking much notice. I spent much of the day fighting with my Mac trying to gain control of iPhoto, and finally worked it out, and I think, had a win. That was when I wasn't watching the V8s on TV. Fishing is not in my field of interest, but I have plenty of spots in mind for Annette to enjoy her pastime as we head further north. DAY 4: 16.6.13 We left 7 Mile Beach about 10ish, and headed into Geraldton. Needed to find a 7 day chemist to stock up the drug supply, get some fuel, and move further north. We dropped into Champion Beach, had a look around Northampton - gorgeous old buildings including the old monastry , now a B&B - before heading down the road to Horrocks, where we booked into the Caravan Park for the night. Had a good piece of the sky to set up the dish, and caught up on the days V8s on Foxtel. We also did a couple of loads of washing. DAY 5: 17.6.13 Annette took off down to the jetty armed with bait, a heavier sinker (to try and outwit the blowies - didn't work), whilst I sat down to have a look at what happened in the world of NASCAR, recorded overnight. Annette returned fishless, having been told that you need to be down at the water at sparrowf..t. Meanwhile, I had paused the race (will watch tonight) and had the van all but ready to go when she returned. We pulled out about 10.10am, and parked in a viewing spot on top of the hill to make a couple of phone calls, and who should pull up, but a couple of friends from Bridgetown, Rob and Jane. And so we solved the world's problems, they headed on down the hill, and we proceeded across the dirt road to the Port Gregory Rd, and on to said village. There were more caravans gathered there than you would find at George Day Caravans lot. Then it was on the road to Kalbarri, which we decided to pass thru stopping only to top up the tank - we had spent a fair bit of time in the town in recent times - and continued on towards Carnarvon. Tonight we are in a rest stop about 80 kms from Billabong, where we hope to catch up with Shane Anderson from Postcard Adventures Australia. Now, where is that remote ……..? We were in no hurry, and got moving about 9.20 this morning, and first point of call was Billabong Roadhouse. Unfortunately, we missed Shane Anderson, as he had gone down to Geraldton yesterday and won’t be back until Wednesday. We trucked on at a leisurely pace, stopping off at the Gladstone Scenic lookout near Wooramel, where some tourists have taken a great deal of trouble to set up a colony of Gnomes looking out across the plain towards the ocean. At about 2.30, I had been suffering a bit of sinus discomfort, and so we found a rest stop that looked as though it would do for the night, hung out some washing that didn’t dry last night, and hit the sack for a papa nap for an hour and a half. Tonight, we are just 93 kms from Carnarvon. DAY 7: 19.6.13 We rose to another beautiful, if a bit chilly morning, and readied ourselves to hit the road again. 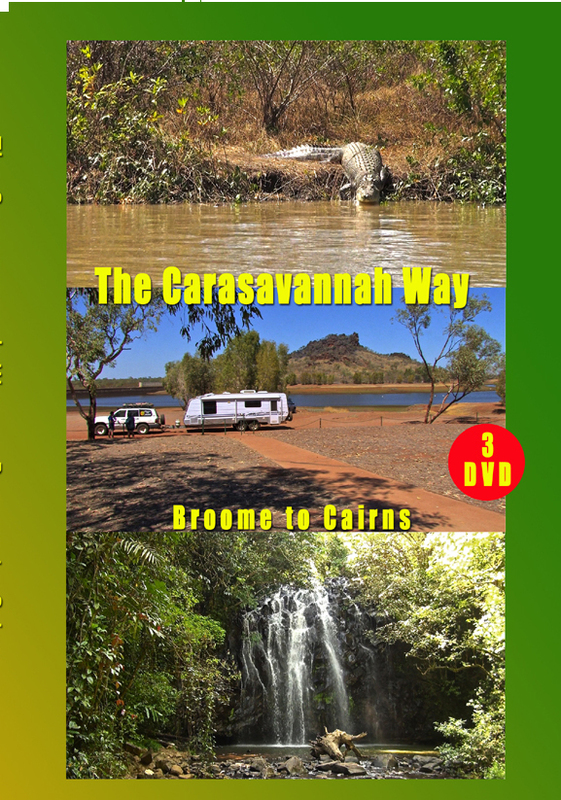 This time, only a hundred kms to Carnarvon, where we booked into the Wintersun Top Tourist Park for a couple of nights. We got into town to get a couple of jobs out of the way, before cruising around the inlet that is part of the mouth of the Gascoyne River. The Gascoyne is 830 kms long, and is referred to as the blood stream of Carnarvon. It is mainly a subterranean river when not in flood, and it’s water supply and fertile red sands provide life to the town and its flourishing plantations. We then found our way out to one of the plantations, where we stocked up on some frozen mango cheeks and some other fruits. DAY 8: 20.6.13 Tomorrow, we move on, and so today was spent shopping and stocking up on supplies for the next phase of our trip north, which will take us via Onslow to Karratha. We bought some frozen local mullet and cod ...... Annette hasn’t taken to the waters with her rod again recently.... but that’s ok, she has some great ideas for fish based meals over the next week or so. For those that are interested. Diesel Carnarvon $1.659. ULP $1.629 - There is a Woolworths Caltex. DAY 9 21.6.13 We got away from Carnarvon about 10.30, and set sail for Minilya. We pulled up at the Lydon River rest stop for lunch, and spent some time having a look around the (dry) river bed. After photographing some of the local feathered population, we again hit the road. We stopped for fuel at Minilya, and were surprised to find that Diesel was the same price as Carnarvon at $1.659. We noticed that the sandhills were running parallel to the road. We reached Burkett Road Rest Stop, and decided that we would look elsewhere for a campspot that suited us better. Only 1.9 kms down the road, we found a great little metal dump that fitted the bill perfectly, set up the dish, and watched the Hawthorn/Eagles game. DAY 10 22.6.13 We were on the road by 9.30, and heading for the Barradale Rest Stop. We are in no hurry, and so later starts and early finishes are all good. We are sitting around the 80 kph, averaging just under 5 kpl towing the “hotel” as my eldest son likes to call it. Also, I had climbed out of bed at 6.30 and had pretty much designed a cover for a new DVD project I am working on by breakfast time. We now found that we we running at right angles to the sand hills, and then we hit the first range of hills that feature Mt Alexander at some 410m. Nanuturra Roadhouse is situated on the Ashburton River. We got our first taste of high fuel prices when we discovered the $1.909 tag on the bowser. We were heading for Onslow, and having fairly full tanks, decided that we would pass, and fill up when we reached the coastal town ......... wrong move ......... Diesel is $1.989, and Unleaded is $2.06. Our next point of call is Fortescue, and we had more than enough fuel to do that, but we wanted to go out to Old Onslow Town, and so, decided to heck with it, and filled up. In future, we will stick with our strategy of topping up the tank each time we hit a road house. We arrived in Onslow, and discovered that there are two caravan parks, one was full, and the other didn’t appeal to us over much. We had a look around, filled the tank, and headed out to Three Mile Pool near Old Onslow Town, where we joined a group of Free Campers along side the Ashburton, and Annette chucked in a line. As I write, no result. But very pleasant surroundings. DAY 11 23.6.13 We checked the BOM site Radar, and had a close look at Foxtel’s Weather Channel, and decided that with a couple of dirt roads that had already taken a hammering in the last week, and were showing that even a light downpour would be enough to close them, that we would stay in front of proceedings and head back to the bitumen. It seemed that rain may have already taken it’s toll on one of our planned routes, with the Onlsow - Peedamulla Road already closed to all traffic. However, where we had camped, and indeed on the road back to the North West Coastal Highway ........ not a skerrick. Subsequent Radar checks have shown us that the rain appears to have gone south of Onslow .... so far. Anyhow, we are subsequently parked about 40kms from Karratha beside the Maitland River. We believe that we can expect some fairly heavy rain over the next couple of days. The drive from the Onlsow turnoff took us through differing landscapes, varying from fairly flat grasslands, to areas of rocky outcrops and small ranges of hills. We arrived at Fortescue Roadhouse, and parked near the river to take a lunch break. The cost of Fuel at Fortescue Roadhouse was $1.88 for Diesel and $1.90 for unleaded. DAY 12 24.6.13 It rained for much of the night, and where we were camped was at the bottom of a dirt road. Up here, when a dirt road gets wet, it becomes instant bog, and so we decided to try and outrun the expected 100mm that was predicted for the area. The slight gradient back to the main road provided plenty of wheelspin, and I reckon that if we had stayed much longer, it could have been interesting with a 31/2 tonne caravan in tow. We decided to bypass Dampier, Karratha, Roebourne and environs, and try to get closer to Port Hedland. The we got further East the sky lightened up, and showed up black in the rear vision mirrors. We refuelled at Travel Stop on the main highway near Karratha, Diesel $1.689 - sorry about ULP and Gas, it was P.....g down and the pumps were out in the paddock. The rain started to let up, but where we have stopped at West Peawah River (about 100kms from Port Hedland), it has rained constantly. We decided to stay here for a couple of nights, as I have mail due to arrive in Port Hedland near weeks end, but we may be forced to move on if the weather doesn’t let up. Annette, having been rudely awakened about an hour before her usual rising time, made up for it with about a 3 hour sleep this afternoon, whilst I watched the NASCAR race from Sonoma that I recorded last night. As I type this at 4.53pm, it is getting quite dark (has been since about 3pm), and the rain has lifted in intensity. We have somehow managed to sporadic internet, and the Radar pic shows that the rain is situated directly over us, and some heavier showers can be expected. 8.23 am. It occurred to me during the night, that there had been no traffic past our Rest Stop for some hours. The weather news on ABC Radio confirmed that over 100 mm of rain had fallen in the past 24 hours, and the North West Coastal Hwy was closed to all traffic. And so, we won't be moving for a little while. 11.45 am. The Pilbara and inland are being shutdown, as rain continues inland. Port Hedland it seems is flooded and they are worrying about the drains being able to cope with a high tide expected…… and here at Peawah River, the river itself was dry as a bone last night, and this morning is flowing quite rapidly and is about 100 metres wide. The level has dropped since earlier this morning though. Travellers who have made a bit of a dash have reported water across the road rising and flowing reasonably swiftly. 12.46 pm. The rain seems to have moved between Port Hedland and Broome. It hasn't rained here for a few hours now, and the ground is drying out. Although the Highway is still officially closed, there are people who are ignoring the closure and travelling through. DAY 14 26.6.13 Well, it's been two weeks since we left Perth, and we are way ahead of where we planned to be, courtesy of the weather. We had to bypass a number of planned destinations whilst trying to stay ahead of the rain, but regardless, we are now in Port Hedland (or South Hedland to be exact) safe and sound..... can't beat that. We Had a number of sections of road with some water still over them, and there was huge expanses of water on the paddocks on either side of the road. We arrived at South Hedland shopping centre (which was pretty much surrounded by lakes), did the necessary, phoned for a quote on a basic vehicle service, and figured they could shove their $520 up their hoist. Another place I enquired at was surrounded by vehicles waiting to be serviced (must have been nearly 30 in all) and was told that "yep, I can fit you in, in about 6 weeks time". He told me I had a better chance in Broome. We went for a tour of PH, watched an ore ship being piloted into Port, took a run along the beach (road by car ..... not puff puff running .....), Annette threw a line in, and lost her hook and lure on a rock snag under the water, went shopping at PH ......... and then took the wrong road out of town back to SH. Hedland is a funny place. There is the original PH, which is basically a port these days, has next to no main amenities, and is stained by red dirt. SH on the other hand is the main hub, has a proper shopping centre, hospital, Government services etc, and is 20 kms away. WE fueled up at the Caltex in SH, $1.649 for diesel, , and they were happy for us to fill the water tank on the caravan. We had enquired about caravan park accomodation, and wound up in an overflow at the golf club - no power or water, but we are self sufficient, so that didn't worry us. As I write this, The Eastern Staters are all over at the club watching the State Of Origin match, and just as a point of interest, I was at Bramwell Juntion in Qld when Kevin Rudd got dumped, and I was in Port Hedland when he got reinstated. DAY 16 28.6.13 Up bright and early ... for us , anyway, and headed into South Hedland for some supplies.Now I told you about the cost of living up here, well I had to exchange a Gas Bottle (no BCF up here) and it cost me $55. Talk about highway robbery. But it's not ALL bad. Because of the number of travellers who are passing through Port Hedland, the Golf Club has an overflow situation happening. It's not cheap, but in the overall scheme of things, it's a steal ... if you get what I mean. It costs $25 per night - no power or water on site, but showers and toilets are available, as well as a well stocked bar in the clubhouse. A washing machine is available. We refueled, ($1.649 Diesel ..... sorry ULP and Gas users, I keep forgetting to look at the pump prices) topped up the water supply, collected the mail, and hit the road. Plenty of water lying around still, and the DeGrey River is huge at the moment. The camp ground was being well patronised as we passed through - interesting, it has TWO dump points. This afternoon we pulled up at a rest stop a little way past Pardoo Roadhouse. Not a lot of distance today, but who's in a hurry? DAY 17 29.6.13 We had stopped at a parking bay about 30 kms past Pardoo last night, and had a couple of trucks for company. This morning we woke to a stiff Easterly breeze, that was going to become a headwind for the mornings travel. Although we were still travelling at our customary 75-80 kph (we are in no hurry and fuel conservation is high on our priorities) the fuel gauge was falling like a stone. And then the turnoff arrived for the 80 Mile Beach, and 25 minutes later we were booking into the caravan park. Although I have had a look at the beach a couple of times in the past, I have never stayed here. The current rate is $41 per night, and there is no concession until you have been here 4 weeks, and then I believe a 10% discount can be negotiated. This is a big park, and many of the campers have been here since the start of the season and will remain until the end. Fishing it appears is the main pastime up here, and as the tide approached high tide today, there was a steady exodus of vehicles out of the park and onto the beach, all heading for their favourite fishing spots. We set up, took a look at the beach, spent a moment at the Vietnam Veterans War Memorial (opened in 2010), before having a bite to eat, and then Annette set off down to the beach with her fishing gear whilst I dug out the cameras and jumped in the car to go and re-familiarise myself with how they work. We reach Broome shortly, and the main reason for our trip becomes our priority. Something I have noticed, is that the North West Coastal Hwy to Port Hedland, has a goodly number of 24 hour rest stops (with dump points), but north of PH, they are very scant. I mentioned De Grey yesterday, and then it is a just couple of roadhouses and about 3 rest areas that are mentioned in Freecamps 7 for the next 360 odd kms. DAY 18 30.6.13 We left the Eighty Mile Beach caravan park and headed for Sandfire Flats Roadhouse. It was reminiscent of an ultra cheap price petrol promotion by a city station, as cars and caravans lined up to take their turn at feeding from the diesel pumps. ($1.89 Diesel) We took the opportunity to have morning tea and make a couple of phone calls (There is signal at Sandfire) before once again hitting the road. We were driving into a stiff headwind, and one caravan stayed put behind us, refusing to overtake, advising us on the UHF that he was using us as a wind break. Lunch beckoned, as we arrived at the Stanley Rest stop, which was pretty much chocka with vans parked up already, and with others arriving and departing in a steady stream. After feeding, we continued on, and in keeping with our policy of “who’s in a hurry?” pulled into Goldwire Rest Area - now there are 200 caravan bays at the 80 mile Beach Caravan Park, and I reckon there weren’t too many short of that number in this Rest Stop .... well, yes,I do stretch the truth a little, but again, it was chockas, and we chose to continue on to a truck bay, where we have the place to ourselves, set up the dish, and Annette retired to the flat to read a book, and i settled down to watching a bit of telly. DAY 19 1.7.13 We arrived at Roebuck Plains Roadhouse, and decided that we would book into the Caravan Park for the next couple of nights, whilst we get ourselves sorted for the Filming Expedition ahead of us. We are 34 kms from Broome, and so having dropped the van, we took off into town, set up a car service for tomorrow, had a blood test done, and then Lunch in the main street of Chinatown. A bit of clothes shopping by Annette, and then a tour of the town and surroundings. Cable Beach was chockas at 4.30pm, and the service road to the beach is one car wide - a really dumb idea. You would think that the council would either widen it, close it, or put a light system which shows red for so long and green for so long - ala what you see on the roads .......... nup. I don't know what I think of Broome.... as usual, whilst it thrives on tourism, I reckon tourism has killed the charm of the place, as it seems to do everywhere that becomes popular. Best kept secrets can no longer hide behind that title, and "progress" mows them down. The natural attractions remain the same, but the human intervention seems to not know how to attain a balance between retaining the charm and the need to prosper from the invasion of tourists of all ilks.